So what do you do if you think you do actually have a soul which is hungry? 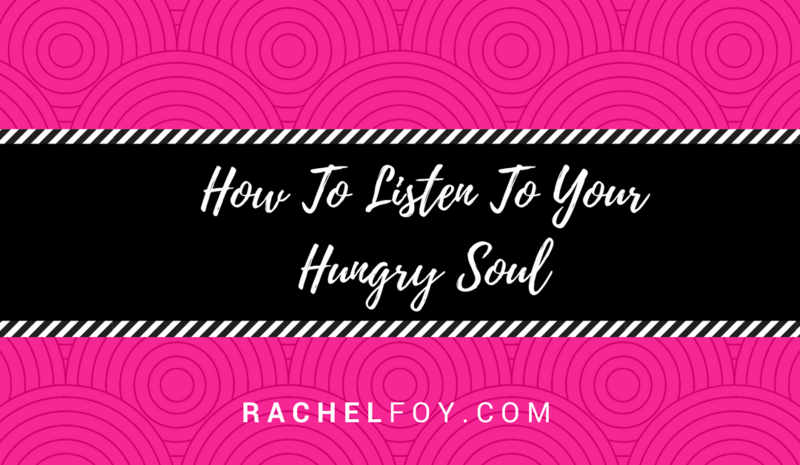 Hello there my little soul beam, it’s Rachel here and today I would like to have a conversation with you about how to listen to your hungry soul. 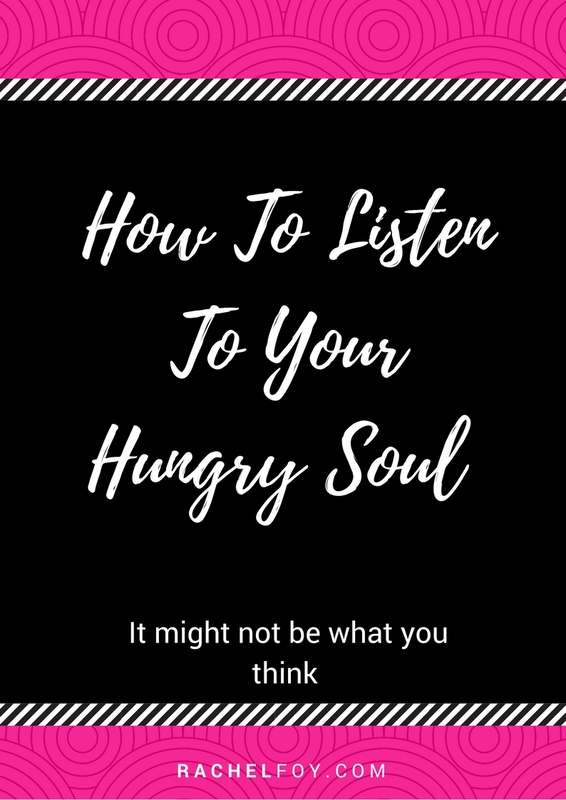 So you may have already seen and read the previous video and blog post (you can find it HERE), which was all about how you know whether you have a hungry soul. Now I want to give you some suggestions and tips on how you can go about listening to those hungers. This sounds really simple and some of this stuff isn’t difficult and overcomplicated, there isn’t a secret recipe that you don’t yet know about, some of this is intuitive and common sense but many of us don’t do it for whatever reason. Let me expand on this and help you appreciate why this is so important. Let’s imagine that right now you are doing your stuff, you go to work, you’ve maybe got children, a house, your partner, husband, friends, family and life is a bit busy and manic. On top of that perhaps you think you have food problems. You might obsess about your weight, you feel conscious about how you look, and you believe you want to drop 10lbs in order for everything to start feeling better. Now the first thing which I highly encourage you to do is to start to listen and I mean really learn to listen to yourself. Learn to start focusing and shifingt your energy away from ‘doing’ all the time – the “to-do” list, doing this, doing that – and actually try and simply “be” a little bit more. When I refer to the hungry soul, this is obviously a body thing, and the problem that I see with so many incredible women is they aren’t in their bodies, they aren’t embodied or connected and because of that they spend all of their time in their head! If you are in your head it is impossible to listen to your soul as your head and soul are separate, yet when you want to tune into your soul and let her point you in the direction of what she is craving and maybe even starving for, you have to be connected and listening in order to hear her. The more we can start to listen to ourselves, the more momentum and clarity you are going to gain in terms of what your hungry soul is craving. With that information you can start to feed her. This carries on from the first point but I just want to bring in food here very briefly. If you struggle with food at the moment and perhaps turn to food when you are stressed, or you know you are an emotional eater – you can turn to food when you feel overwhelmed, angry, lonely fed up – beneath that behavior there is some kind of emotional trigger. Now I’m not going to talk about emotional eater now but I do just want to mention that it isn’t fundamentally wrong nor is it something you need to be ashamed of. If you can look past the food stuff and you can focus on what we are talking about, you can use those emotional triggers as really powerful information for you to recognise, understand and listen to, for this is what your hungry soul is bringing up for you. So the 2nd thing is about following your emotion. When you are listening and tuning in, if you recognize that you are feeling anxious, what can you do about it? As that anxiety is there for a reason. This is something which I struggled with myself when I was food and weight obsessed and had loads of other hungry soul symptoms. I was very disconnected to my emotions and feelings, so whenever I felt anxious (which I did often), I didn’t know what to do with it. It was too uncomfortable, I didn’t want to go there, so my coping strategy was to stuff it down with a massive piece of cake and I got into the habit of doing that and there may be a good chance that you do the same. So I invite you to become curious around these emotions and feelings which you have, and I know that these feelings can make us feel uncomfortable. No-one wants to sit in the emotions of anxiety, overwhelm, fear or panic, but what most of us do is not even sit in it for a millisecondnd, we shove it down with food, we switch it off, we detach ourselves, get even more busy so we don’t have to acknowledge what’s there. Yet by doing that over and over again, we separate ourselves from our soul hunger, we don’t listen, we become disembodied women and certainly not a soul fed women. I invite you to start using your emotions almost like these incredibly intricate internal compasses because when you feel anxious there is a reason for it. When you feel scared there is a reason for it, the same for overwhelm. So rather than saying to yourself, ‘I don’t want to feel that so I’m going to ignore it, pretend it doesn’t exist or stuff it down with a piece of cake,’ what if you could sit with that emotion and follow it on it’s journey and see where it takes you? Now before you think this isn’t for you as it’s too spiritual and woo woo, that’s not what it is. I think meditation over the years has shifted in terms of people’s perceptions of it.